GlobalData’s latest analysis of the global planned and announced trunk/transmission oil and gas pipelines for the period 2018 to 2022 shows that the US has the longest planned pipelines length globally with 35,065km. India and Russia follow with 29,142 km and 26,566 km respectively. Presently, the US accounts for 14.3% of the total planned and announced trunk/transmission oil and gas pipelines length globally. The country has the highest number of planned and announced pipeline additions with 184. 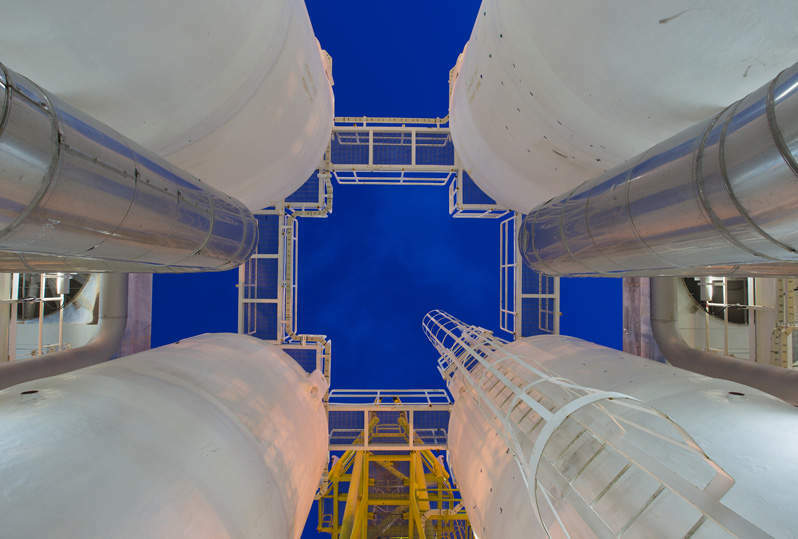 Among these, Express Platte Twin Expansion and Elk Creek NGL pipelines are the longest planned and announced pipelines with 1,561 km and 1,448 km respectively. 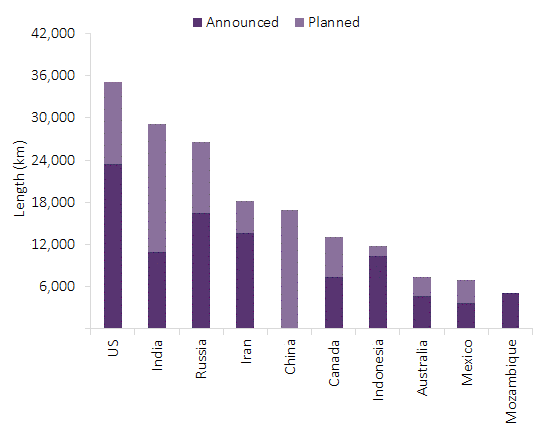 Image: top countries with most planned pipelines length globally. Credit: Midstream Analytics. India has 12% share in the global planned and announced oil and gas pipelines length for the period 2018 to 2022. The country has 48 planned pipelines. Jagdishpur–Haldia and Surat–Paradip are the longest planned pipelines in the country with 2,655km and 1,990km respectively. Russia contributes about 10.8% of the global planned and announced trunk/transmission oil and gas pipelines length. The country has 30 planned and announced pipeline additions. Russia–India and Altai Gas are the longest planned and announced pipelines with lengths of 6,000km and 2,600km respectively. The fourth major contributor is Iran with 18,255km, which is about 7.4% of the global planned and announced trunk / transmission oil and gas pipelines length during 2018 to 2022. The country is expected to have 22 planned and announced pipeline additions during the period. China is the fifth largest contributor to the global planned and announced trunk/transmission oil and gas pipelines length with 16,928km, which accounts about 7% of the global total. Presently there are 15 planned pipelines that would start operations during 2018 to 2022. Canada contributes about 13,042km to the global planned and announced oil and gas pipelines length, which is about 5.3% of the global total. Presently there are 34 planned pipelines that would start operations during 2018 to 2022. Indonesia contributes about 11,729km, which is about 4.8% of the global planned and announced trunk/transmission oil and gas pipelines length. It has 22 planned pipelines from 2018 to 2022. Australia, Mexico and Mozambique collectively contribute about 19,444km, which is about 8% of the global planned and announced oil and gas pipelines length during 2018 to 2022.